Two oscillators, a multimode filter, amp and filter modulation, step sequencing and an arpeggiator. Great product just what i expected. Amazing synth. Holds it's own next to my SH-101 and Subsequent 37cv. The sound is so strong and clear, plus the feeling on the keys is amazing. Great value for money. This is a great thing. Sure, you could spend a billion dollars and get better but hey, who has a billion dollars. It's analogue, it's programmable, it has some very decent factory presets. If you spend the time you can make some rather nice sounds yourself. If it looks like what you want then yes, it probably is. I like it. Love this unit! the moment it arrived I plugged it in and was inspired to create! Sounds very rich and love the huge filter knob. The Bass Station II is everything I could ask for in an anlogue mono synth. It has plenty of meat and character! Sound design is fun and intuitive. Plus build quality is solid! I love it! It's my go-to synth for bass and much more! Having purchased an ultranova a few years ago I decided to buy the BS2 and it may be small but it does pack a punch. It's size denotes that many functions are hidden and these can be accessed using a function button and the keyboard and display. The main functions are via knobs on the front panel. One feature I like is that if I move a control its very easy to find its original position with up and down arrows in the display. Last but not least its a Novation product which means service second to none, the Novation crew are always available either by phone, chat session or email and always do their utmost to assist. The only bit i wasn't too keen on and its a minor thing was the way that the sequencer when set will only start by sending a note or touching a key, unlike all my other synths, however, its only a small thing so don't let that detract from your purchase. its a small competent powerful synth with a good price. Well worth the money I paid. I did a lot of research and chose the BS2 because you can save lots of patches on the device and to your PC. It has lived up to all expectations and my musical friends love it too, one at least buying one for himself. Great system where if you change a sound display arrows show you how to get back. Hard to fault, I had a problem with the library software, but the support guys helped out very well. I use Reaper and it syncs up fine for recording or sequencing. Would recommend highly. This is a fantastic sounding fully featured bass and lead mono synthesiser. The build quality is also also good. It's the fattest small synth I have ever laid my fingers on. Fun and easy to use, kicks out some excellent killer sounds. Nice. I own a lot of synths, both analog and digital. The Bass Station II is an great sounding synth that is a lot more flexible than other mono synths in its price range. The bass sounds as phat as a Moog. The sound quality makes up for the plastic chassis. Great synth, the first hardware synth I've bought, easy to use, great sound, very versatile. Can't recommend enough. If you've not had an analogue hardware synth before, or are considering purchasing one, or if it's going to be your first one, GET ONE OF THESE! You won't regret it. Absolute powerhouse synth, I absolutely love my Bass Station it in every way. I really could never do without it now the noises it can make are unbelievable. Its so so much fun to jam with other people too! Compact and Easy to learn how to synthesize massive sounds! Thanks, Peace and Love! The Bass Station II is perhaps one of the best synths out there. The fact that you can store your sound is something that many other manufacturers simply forget to include. Great arpeggios and sequencer. Great sounding synth overall. It is very powerful in terms of synthesis. Now it has some big issue: SYNC. You can't really sync it so it will be quantized with another instrument. You can however use the midi to get the clock sync... Also, too many knobs have dual jobs... I never liked the idea that one thing does another if you hold this or switch that and blah blah blah... With all that said, it is worth the money and better than many other monophonic synths out there! Fun to play, but hard to get the hang of. A beautiful synth, solid build, looks great and sounds terrific. If you want a mono analogue synth to rattle your teeth, this is the one. The BassStation II is a BEAST! It can sound gritty and dirty, or it can be silky smooth. It also makes a phenomenal 25 key MIDI controller! One of my favorite things to do is to load up a sound on one of my other hardware pieces, MIDI it up as a module, and then engage the arpeggiator, as the BassStation spits the arp'ed notes out the MIDI port. 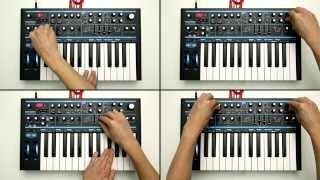 Everything Novation does is fantastic, but the BassStation II is fantastic redefined! Great little analogue monosynth with a big sound. While not the most characterful sounding synth out there, it's a great all-rounder and fits well into any mix. The filter sounds superb, and there are enough modulation options to create some pretty interesting sounds. I do wish they'd update the firmware to include adjustable filter key tracking, and (probably over-reaching here) perhaps add duophonic capabilities? All-in-all I highly recommend the BS2 - you won't be disappointed. Awesome piece of kit. I've used it on most of my tracks since day 1 and its now a solid part of my live show. Novation smash it every time. I love my BS2. The sequencer is very nice. Great synth, but without CV & gate these days had to sell it on. Be great if it had the patch options of the Arturia mono synths. Sounds huge. Great set of factory presets as starting points. I use it for bass but it's very capable with leads. I love the oversized filter knob. Good hands-on programming and good feedback via a single pair of LEDs that help determine whether the last turned pot is above or below the programmed value. 128 memory slots - about half of which come with factory content (the rest are INIT). That's been enough for me. I've found that the overdrive, distortion and osc filter mod can produce some nice tonal variations. I practice with it weekly and play out with it once every couple of months. The knobs feel good. The toggle switches seem like they might be be weakest link physically (although I haven't actually had any problems). The keyboard is unweighted and I find I have to play just a little more carefully to get a clean performance on it. As I've seen in other reviews - if it were stolen I would replace it with another. If you have £350 to spend on a pure analogue monosynth you wont be disappointed. I wont go on about the specs as you can read them elsewhere. Its simplicity to use great feeling keyboard and has become my go to synth for melodic leads and ground wobbling b-lines! Love it! Bass Station II comes loaded with 64 diverse presets designed to showcase its incredible sonic flexibility. Visit the Novation website to download new artist patches to keep you inspired, and create your own sounds from scratch and save them in one of the 64 user preset slots. A free software librarian lets to manage your Bass Station II's patches. Create a huge variety of sounds: two tuneable, syncable analogue oscillators with a selection of four waveforms, plus sub-oscillator, noise and ring modulation. Enormous bass and shrieking leads: switch the Classic Filter between low-, high- and band-pass modes with 12 and 24dB/octave slopes. Improved analogue filter stage: the 24dB Acid Filter is even darker, wetter and smoother than the Classic. Turn Jekyll to Hyde: create crunchy, aggressive sounds with true analogue distortion, filter-modulation effects and filter overdrive. Easily load and save patches: There's space for 128 patches, and 64 factory sounds are included. Downloadable artist packs cover a huge range of styles and give you even more presets to get inspired, and you can create your own sounds from scratch and save them in any preset slot. Get instant inspiration: record notes, ties, rests and rhythms in real time using the step sequencer and arpeggiator, then store them for use with any patch. Experiment easily: get hands-on with the comprehensive array of controls, cleverly arranged for intuitive patch design and sound editing. Flexible modulation: triangle, sawtooth and square LFO waveforms, as well as sample and hold, and two ADSR envelopes for filter, pitch and pulse width modulation. Connect to hardware and software: connect and sync to your music software and MIDI-compatible hardware. Player's keyboard: full sized 25-note velocity-sensitive keyboard, with fast synth-action action and aftertouch. Store unlimited sounds: archive as many patches as you like on your Mac or PC using the Librarian Software. Designed to transport Bass Station II safely. It is lined with paddingand comes with additional pockets.